Strouse designs, manufactures, and assembles adhesive parts, finished components, and packaged products for global manufacturers. With a quality management system (QMS) registered to the ISO 9001:2008 standard, we're committed to delivering a product that meets your design specifications while providing engineering service and customer support that exceeds your expectations. Our broad range of adhesive converting capabilities allows us to provide components and finished products for electronics manufacturers, medical device companies, automotive manufacturers as well as their tiered suppliers and other industrial organizations. There's often more to an adhesive solution than just the material and a liner and it's important to partner with an experienced converter who understands what it's like to manage the process from an idea to full production and assembly. Strouse engineers help you design a solution that solves a functional need but also one that fits into your assembly process. We focus on creating products that create positive outcomes for your organization whether it's saving hundreds of labor hours with assembly or simplifying a process. We then create prototype components and products that you can test fit and tweak the design as needed. Our press operators convert large format adhesives into usable products. These materials are often purchased in bulk to provide you the best pricing. Lastly our assembly, finishing, and packing teams can build the products you need and provide them in the format that is most efficient for your business. Throughout the entire process our quality assurance team randomly inspects raw materials and products before, during and after production runs to ensure we deliver products that meet your specifications. By working with an experienced converter for contract assembly and manufacturing you have the luxury of being able to scale production to meet the market demand of your product. Manufacturing components and finished products in-house can be costly. There are many upfront expenses such as equipment and specialized machinery that can become a major hurdle to manufacturing products. Then you'll need to hire employees that know how to operate the machines and put them through training which can take months to get them up to speed. You may even have to find or make space to house new equipment, raw materials, and stock finished products. If you're required to meet FDA regulations, like many medical devices, then it's likely you'll need specialized facilities that adhere to a certain ISO standard of clean environments. 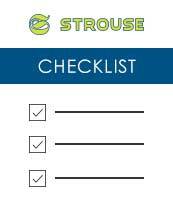 Leverage Strouse as a partner to manufacture and assemble your adhesive tape components and products. Our staff oversees each product as it moves through our process, from design and development to prototyping and mass production and assembly. Component assembly can be challenging for manufacturers. It requires the proper machinery, managing the adhesive, creating a repeatable process, and finding a way to have this process fit into your assembly. For manufacturers in the development and prototyping stages, the initial cost for equipment to dispense liquid adhesives can be a major road block.